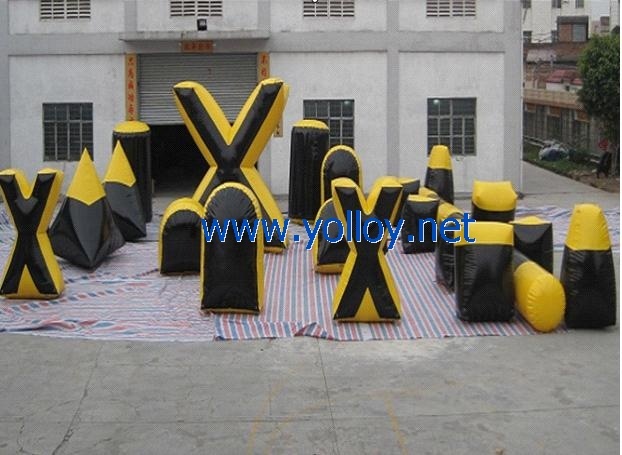 To play Inflatable paintball game, you need two teams. There is a flag placed in the center of the field, the rule of the paintball war is that one team capture the flag and hang it at the opposing team's end. But before you get the flag, you must eliminate the opposition in the extreme paintball game. When a paintball hits a player, the emulation occurs, so please carefully cover you with the paintball bunkers. Once a player is eliminated, he is out and must exit the field and wait in the designated area; the inflatable paintball game is over once all players have been eliminated or flag hung. The this paintball world, Strategic planning, risk taking, whilst working together and constantly communicating are essential ingredients for a team to succeed. And that is also why paintball games are so popular. To play paintball games, there are many kinds of paintball game field, such as woods, abandoned house and inflatable paintball bunkers. The most popular one is the inflatable bunkers. For this inflatable paintball field, there are 23 bunkers in total, here the details. Please check.